Today we had an invitation for a very special restaurant. 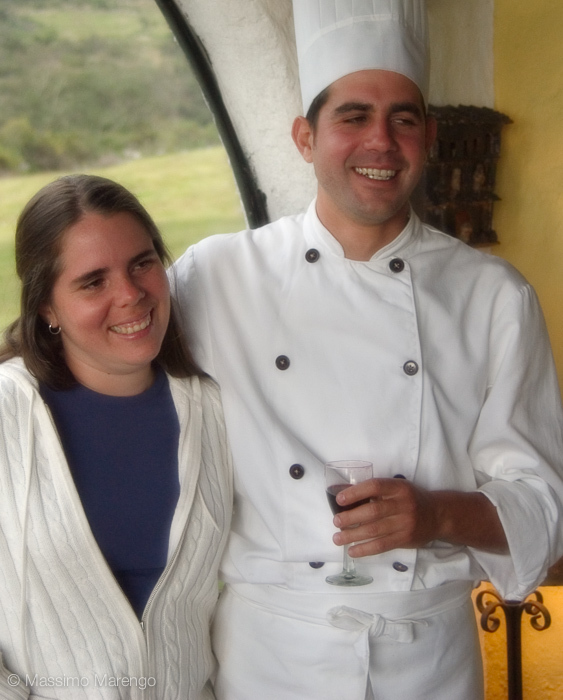 Juan Antonio, one of Mayli’s cousins, is the chef of a gourmet restaurant at La Culata, one of the many beautiful valleys in Merida’s Paramo andino. The restaurant had originally been a vacation house for the family, and has been recently converted into a restaurant by Juan Antonio and his wife. I really recommend anybody passing by Merida to stop at the restaurant, not just because they are family, but because the cuisine is really good. The pork in orange sauce I had today was simply awesome and worth the trip on the winding mountain road to get there from the city. Along the road the usual magnificent scenery of Merida’s Andes. Today the sky was covered by high clouds, and the usual low level clouds hanging on the peaks were missing, so we were treated with a view of the Pico Bolivar (photo above), which is the highest Venezuelan mountain (5,007m = 16,427ft). 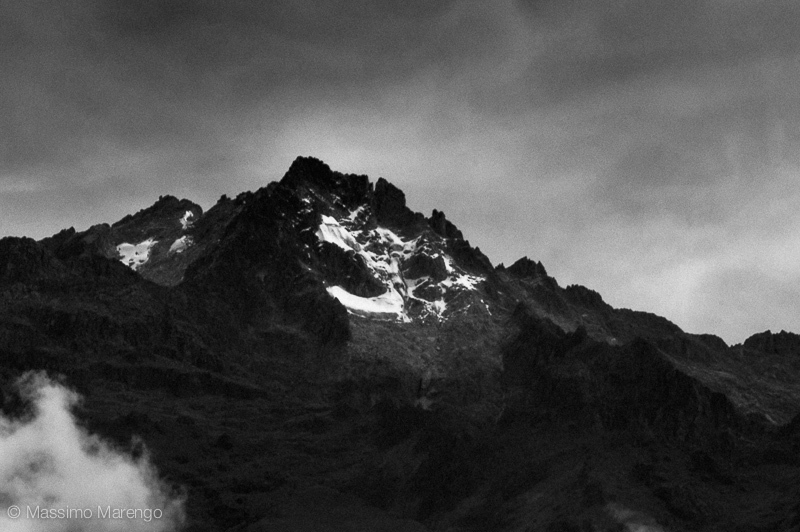 The Pico Bolivar is one of the five “aguilas blancas” (white eagles), which are the five peaks around Merida once covered by glaciers. Due to global warming the Pico Bolivar is the only venezuelan mountain left with a small glaciated area, which is retreating at an accelerated rate. The five aguilas blancas are so called because of an ancient legend of the local indian population. The legend was recorded by Tulio Febres-Cordero, Mayli’s great-great-grandfather which was a local historian and spent his life collecting legends and traditions of the local indian population. This legend says that once upon a time there were five enormous white eagles flying in the skys of Merida’s mountains. These were the times of Caribay, spirit of the aromatic forest, the first woman of the indians Mirripuyes. She was the daughter of the fiery Zuhe (the sun) and the pale Chia (the moon). One day she saw the five beautiful eagles, whose feathers were shining like silver, and she wanted some of them to adorn her regal dress, as she was the princess of the Andes. She started to call the eagles, running after them through valleys and mountains, to no avail. She started to cry, asking for help to Zuhe, her father, and the wind carried her supplications, but the eagles had flown out of sight in the twilight. She then called Chia, her mother, as the wind stopped to make silence. In that moment, when the stars shined over the majestic mountains, the moon came and around her silvery light there were the five white eagles that had returned her call. The five eagles came circling the high peaks, until they descended on the top of the five highest mountains, digging their claws into the living rock. And there they stayed in silence. Caribay started to run, anxious to grab some of the feathers for her dress, but as soon as she arrived to one of them, she gave a cry of fright: the eagles were petrified, and their magnificent plumage was converted into a cold glacier. The moon darkened, the wind blew and a storm covered the five mountains with great quantities of perennial white snow, which can still be seen today as a memory of the furious awakening of the five eagles, when the whistling of the wind in the Paramo echoes the song of Caribay. While Mayli remembers times where Pico Bolivar still had significantly more ice than now, if we go back to the beginning of last century the change is astounding. Have a look at this report (in Spanish, but you can still look at the photos): these glaciers were real glaciers like the one in the Alps: all gone now. Nothing to do with the current post, but I stumbled on this article about the current economical situation in Venezuela. There is a quote from some guy saying that in 2007 he purchased a used Chevy truck for about $3,200. Today he could sell the truck for nearly $24,000. Venezuela is the only country in the world where you can buy something, use it, and the next day it costs more.